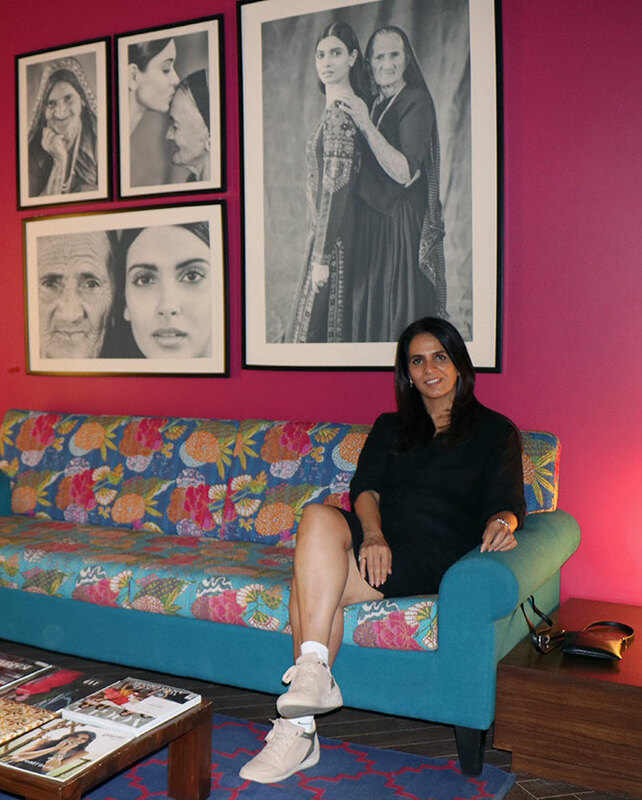 'Fashion changes fast and if you are not keeping up you're getting left behind,' design diva Anita Dongre tells Pavan Lall. Dressed in a summery one-piece dress with her hair pulled back, Anita Dongre looks -- as always -- simple yet voguish as she strides into Olive Bar & Kitchen in Khar, Mumbai. She has picked the restaurant at the last minute, cancelling our original plan to meet at Ming Yang at the Taj Lands End, Bandra. "Sorry, my driver didn't come today and this was easier to walk across to from my place," she explains with a smile. On a rainy Saturday afternoon, Mumbai's Olive, a white-pebbled Mediterranean style eatery, is almost empty but the tall, striking woman who walks in turns heads not because they recognise her but because even when attired simply, she stands out in a crowd. A perfunctory hug later she pulls up the chair next to me. "I know everything they serve here," the die-hard vegan tells me. Dongre opts for a beetroot salad with slices of tender coconut and a Mediterranean crock-pot. I choose a not-as-healthy falafel and hummus to start with, and a vegetarian pizza for the next course. Olive is a regular after-party venue for a host of fashion events -- it can, on some evenings, transform into a nightclub populated by twiggy, 20-something models who have got off a catwalk minutes earlier. The half-deserted restaurant today seems appropriate for our tete-a-tete. Dongre has, in the past, half-seriously described herself as 'a common factory worker'. The industry she operates in has a facade of glamour, but behind the scenes it is a lot of blue-collar sweat and tears. Over the last few years, she has become a force to reckon with in the industry and the envy of many in her peer group. Her eponymous label hit headlines when the duchess of Cambridge, Catherine Middleton, picked a bright floral piece to wear when she was in the country in 2016. The attention actually led Dongre's Web site to crash. 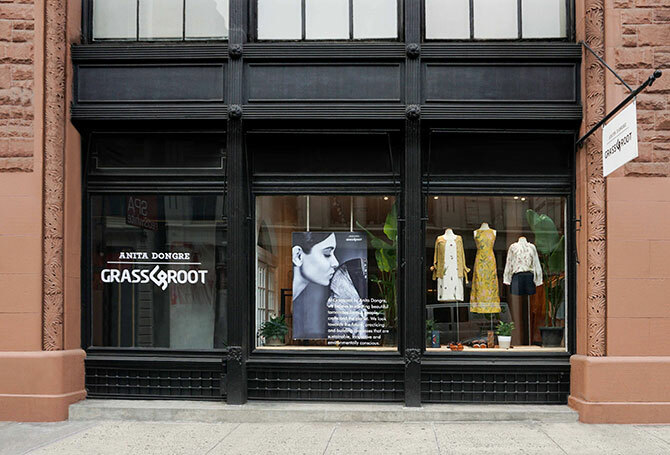 After that, she has launched two stores in quick succession in New York city, and saw her revenue grow to around Rs 6.8 billion a year (FY 2018). Currently, she employs 2,850 people who produce close to 4 million garments a year. Her label is retailed in over 1,000 touch points, including 300 exclusive stores. In comparison, the grande dame of Indian fashion, Ritu Kumar, is just about a-fifth of her size on any given metric -- be it store count, revenue, point of sale, number of brands, number of factories... you name it. "If earlier I had said I am a factory worker, I'd like to think of myself now as a catalyst for women's employment"
Can it get any bigger? Before she takes that question, our waiter arrives with the preliminaries and Dongre encourages me to take a bite from her salad plate which is an explosion of leafy reds and greens interspersed with streaks of white coconut slivers. I promise to do so later and instead, concentrate on my own falafel which is just perfect. "If earlier I had said I am a factory worker, I'd like to think of myself now as a catalyst for women's employment," she says. Dongre's plan is to set up 50 small women-run factories in villages and bring a self-help sort of model to some of the underserved. Two have come up already -- in Charoti and Jawhar villages in Maharashtra. In the next phase, her units will come up in Dhanevari, Shelte, Navi Dapchari and Kudus -- all in tribal-dominated Palghar district in Maharashtra -- under a multiple stakeholder model with government support. "The confidence a woman gets when she earns money on a regular basis for her family changes her for the better and it changes their families as well"
Dongre estimates it will take about of Rs 2 million as capital expenditure to set up a unit in a village. That excludes the cost of land and civil construction. She might even refurbish an unused or vacant community hall and put it to good use. Starting with 50 industrial sewing machines, each unit will train women in cutting, sewing and finishing garments and offer stipends during the learning phase to encourage attendance and course completion. "The confidence a woman gets when she earns money on a regular basis for her family changes her for the better and it changes their families as well," Dongre says. "That excites me more than a new store -- more than anything else right now,"she says, digging into her salad. "Success is when the local community sees their daughters, sisters, wives and mothers as equals"
The Charoti unit employs 49 women, and their average income has jumped from Rs 1,000 per month to about Rs 8,000 each month for doing mostly menial work. This income supports a total of 229 people, including the 180 family members who depend on the 49 artisans. "Success is when the local community sees their daughters, sisters, wives and mothers as equals," she says. How is the business in the key markets -- the cities? "Fashion changes fast and if you are not keeping up you're getting left behind," she says, adding that her customers are also changing constantly and managing that in itself is a balancing act. Dongre pauses and asks if she can try one of the falafels I ordered and I push the plate towards her. "Women are more independent, empowered and bold now and know their mind better; but they haven't had to grapple with change as much," she reflects, adding that last year was slow but that is okay. "You can't have hectic uphill growth every year!" "Our designs are the backbone of our business, that is something we are registering now and will take action soon"
Her mass brand, Global Desi, hit a speed-breaker in 2017 and she points to a couple interlinked trends that are playing out. One, a lot of apparel buying has moved online and she is placed strongly on the Internet with multiple Web sites, Twitter handles, Instagram pages and so on. Second, that is exactly where her designs are getting ripped off and sold in the market at a lower price. "I have actually confronted tailors at smaller shops and asked them why they do this and their answer is, in that case don't put up your designs on Web sites for all to see." "Our designs are the backbone of our business, that is something we are registering now and will take action soon," she adds ruefully. Her main course arrives and it looks healthy beyond description: A bowl of multi-coloured rice, grains and vegetables -- all organic, and all gluten free. "I think they've forgotten your pizza." The waiter is sent a reminder and he runs along to check on it. There are segments that she hasn't tackled yet: Accessories such as ladies bags, purses, shoes, and then the athleisure category. The other big segment that she has not dealt with aggressively is men's fashion, a genre with strong competition from entrenched players such as Wills Lifestyle and Raymonds. Dongre does some ethnic wear for men, but the volumes are small. "I'm happy to let it grow organically," she leaves it at that. Dongre's stature in her industry is enviable as well as unusual. She's one of the very few women to have achieved that scale and retail presence. That makes the game tougher every step of the way. She explains, "In any other business, you create something and it will sustain up to a point even in a downturn; but in fashion, sustaining is harder than starting because you're only as good as your last collection." Dongre stops suddenly and thinks hard. "I think I'm going to try a slice of that pizza," she says after much consideration, adding this would be her first slice of pizza this year. We ponder dessert, then decide against it. Lunch over, we walk towards the exit. I ask, "How many dresses do you have and where do you keep them? An underground vault? A warehouse?" She smiles. "I really am very basic. Worn the same perfume for the last 25 years, and I am in shirt dresses and black trousers and trainers at work most of the time." She grabs her umbrella and makes her parting shot: "There's the brand and then there's the person."